We’ve been in this business for a long time—36 years to be exact—and we can’t begin to recall stories of clients who unfortunately didn’t take the appropriate precautions for their precious metals, losing hundreds, even thousands, of dollars’ worth of their holdings to theft, natural disaster, or just plain forgetfulness. When it comes to storing your precious metals with someone else, what are the three most important factors you consider? If you’re like us, it’s cost, ease of access, and safety. You don’t want the cost of storage to break the bank, and you also want to be able to access your metals quickly and easily in case of emergency. If you’re going to spend money on keeping your most valuable investment safe, you want to get it right the first time. Lucky for you, we have two great options for you—both with our trusted long-time partner, The Perth Mint of Australia. Back in 1997, ASI and The Perth Mint teamed up to co-create the groundbreaking Perth Mint Certificate Program (PMCP). Our goal was to streamline investing and make it more affordable than ever before to buy, sell, and store gold, silver, and platinum. 21 years later, PMCP has grown into our most successful offshore storage program and is beloved by our clients for its security, affordability, and flexibility. Furthermore, PMCP is one of just two government-guaranteed storage programs (the other we’ll be discussing in a moment) in the entire world and is ideal for those looking to hold physical confirmation of their precious metals in their hands. As mentioned before, ease of access is essential. Why pay for something if you can’t tailor it to your needs? In this 21st century world of instant access to everything, you may want a little more from your investment. You can access your bank account online, so why not be able to do the same with your precious metals? Imagine getting off a long flight to Sicily, and suddenly you find the price of silver has dropped. You want to take advantage of the price drop, so you switch on your phone, purchase your metal, and get back to enjoying your vacation. It’s really that easy! 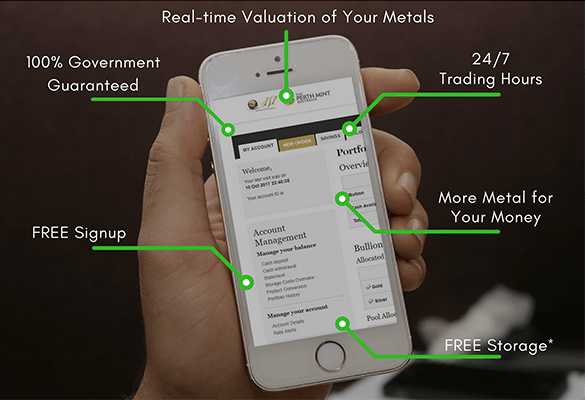 With the Perth Mint Depository Distributor Online (PMDDO), you can now buy, sell, and store gold, silver, and platinum 24/7 online from any device, get live portfolio valuations, and even arrange a monthly gold and silver savings plan—all for a minimum investment of just $50! Investing with PMDDO is simply one of the most cost-effective ways to invest in precious metals, with premiums as low as 0.2%. And just like PMCP, all of your metals—including unallocated metals—are guaranteed by the government of Western Australia and 100% backed with comprehensively insured physical metals—a feature that many other facilities can’t offer! Next time you feel the need to take advantage of market fluctuations—whether it means adding to or liquidating your portfolio—PMDDO is your round-the-clock precious metals solution. As if that weren’t enough to love, you can even get FREE storage* for your metals—making it easier than ever before to start investing in precious metals! To give your portfolio the security and convenience only The Perth Mint can provide, please call us at 800-831-0007 or click below to open your FREE PMDDO account. *Free storage is available for unallocated gold, silver, and platinum.